I was just reading Pyraeus‘ articles on Court Cards, and quickly noticed that the website equates Princes from the Thoth deck with Kings from the Rider-Waite. I was struck by this, as making that connection had never occurred to me, and as I thought about it, some of it made sense – and some of it did not. Certainly I had noticed that many of the Knight Cards across the two decks shared similar meanings – and even names – but I still felt like something was not quite right about the match-ups. After some pondering, I came to the conclusion that the two court card systems are really so completely different as to not really allow for good comparison. 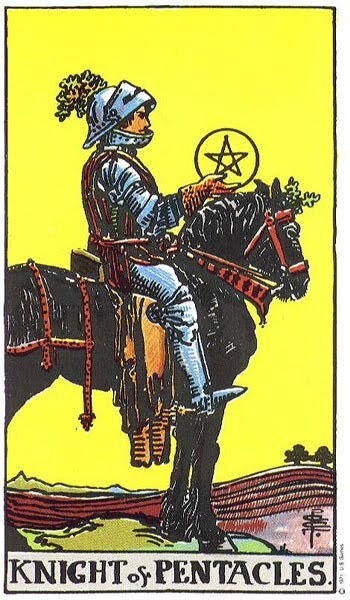 The Rider-Waite court cards – to me, at least – seemed to focus on the Wisdom of the Kings, the Competence of the Queens, the Activity of the Knights, and the Enthusiasm of the Pages. 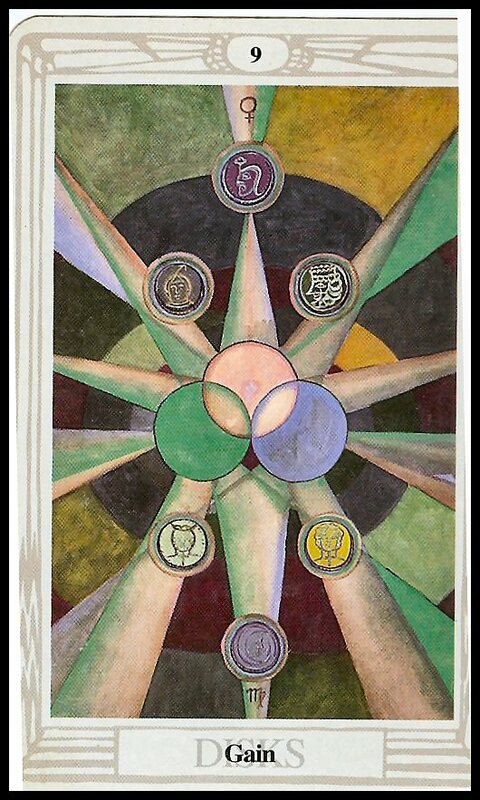 The Thoth system emphasizes the Kabbalistic and elemental system of the court cards, taking different aspects of each element to assign personalities to the cards. 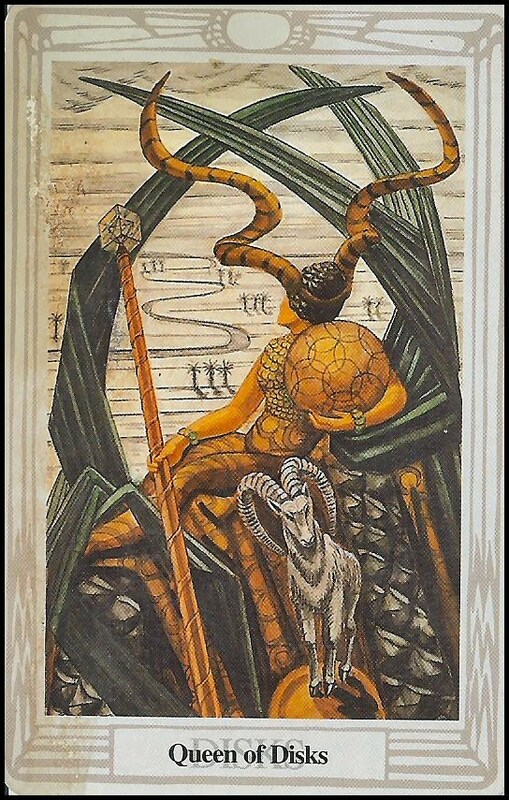 The Rider-Waite cards, then, to me always seemed to represents different aspects of their suit, but in a vastly different way when compared to the way the Thoth deck does it. As such, for my Tarot Challenge, I will continue to do it as I have been (I only have one more Court Card left, anyway), but say now that the two systems really cannot be compared in any way. As such, the Prince of Disks excels in Practical Knowledge, and Lacks Emotions. He is prone to slow, Ponderous movement and is also Meditative. He has both the mental force of Swords and the physical force of Disks, and so quickly can become Unstoppable. He thinks things through before doing them, and so is Thoughtful, and also Ingenious, able to apply to apply his ideas to the real world and Solve Problems. He is Trustworthy, Solid, and Dependable. He is actually very Energetic, but only when he becomes driven to be so, a process which takes a long time; he is Slow to Anger, but when angry is Fierce. He is also Slow to Change is Mind and a Slow Learner, but he still does learn, and Grows slowly and steadily. He is a hard and Steady Worker, and a Competent Manager; he can apply his ideas to reality when he needs to, though he does not excel at it like the Princess of Swords does. The Queen of Disks. This card represents the personality that arises from the Watery part of Earth; the passive, intuitive, emotional part of the practical and down-to-earth individual. She is a people-person, who enjoys life and the company of others. She is pleasant to be around, and works hard to get what she needs, and then does not hesitate in enjoying what she has. She has a great knowledge of the practical side of human emotions and feelings, and is able to and often willing to help people with their problems. The Queen of Disks is Charming and Bighearted, and often acts like a Mother Figure. She is Affectionate and can also be Sensual, concerned with the physical and material nature of human interaction. She is given to being Sexual as well frequently, and has a desire to please her body physically. To these ends, she can also be Seductive, but she does not use her abilities to seduce for her own personal gains; she does it merely to please herself. She is often Quietly Ambitious, but appears to others to be Servile due to her constant helping of others. She is the perfect hostess. She does not scheme or plot in her ambition, but instead Works Hard to get what she wants, always in the Background and out of sight. While she can help other people understand how they feel about themselves and the world, she herself is often rather Dull, and she is not a particularly good entertainer. She may sometimes feel Trapped by her standing and Long to go out and be more useful. She often possesses great practical knowledge, and is Sensible when she needs to be. However, she is also often given to Foolishness when in the company of her friends, and sometimes gives in to Lust and Debauchery. Everyone enjoys being around her, and she works hard to please others to increase her own standing with them, and through them, her standing in the world. She herself will not advance farther, but her actions will help others succeed. 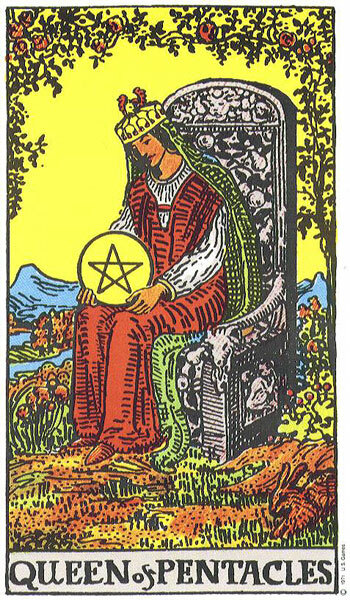 The Rider-Waite art shows a kind-looking woman fondly looking down at a Pentacle she is cradling in her lap. She is caring for it like a mother, and is also surrounded by images of growth and fertility. She herself will not grow further, but she will help others to grow. She also wears an expression of slight discontent, as if she is slightly unhappy with her position, and only gets to live through her children. The Thoth art similarly shows a seated woman cradling a Disk in her arms, but she only seems half there; she gazes longingly off into the distance, wishing for something she will not achieve. A statue of a goat – symbolizing fertility and potential – stands beside her, indicating that those that she rears and teaches will have great potential. Her crown also bears two spiraling horns, emphasizing the idea of continuation (the spiral horns symbolizing infinity) through others. She is surrounded by growth, and yet she herself does not grow. In a reading, this card asks you to examine the role that people with this personality play in your life. Do you know anybody who seems stuck in his or her life, but does all they can to help others move forward? Anyone who longs of doing better things but seems stuck in a rut? Who others ignore and count as part of the background, yet depend on him or her absolutely? Reversed, this card’s energies are hidden or twisted somehow; perhaps this person hides their discontent very well, or her silent ambition is leading her to send others down the wrong path. For those of you interested in supporting a grassroots non-profit organization that funds and runs Script Frenzy and National Novel Writing Month every year, consider donating to their drive to fund a year-round version of NaNoWriMo here! The Knight of Disks. 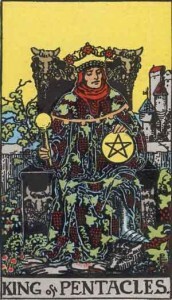 The King of Swords in the Rider-Waite tradition. This card represents the personality that arises from the Fiery aspect of Earth; the active, bold, and creative personality of the practical and down-to-earth person. This is the card representing the personality that will lead that person to great Gain and eventual Wealth, using Power to create great Works. This is the outspoken, stubborn individual concerned with succeeding in the world. In the traditional “breadwinning” family, this card represents the breadwinner and Father Figure, who provides for his family and sustains it. This person, then, has experienced great Material Success, and has much Wealth. They did not inherit it all; they are not spoiled heirs or heiresses. They earned it through their Industrious behavior and their Competence. They are Capable and Enduring; they won’t give up until they have succeeded. They are the fire that never goes out, and the landslide that does not stop until it has reached its destination. They are dedicated to Laboring for gain, and are sometimes overly (or at least extremely) Materialistic. They can be very Patient; these are the people who can work there way up to great wealth from nothing through hard work and never-ending patience. They do not rise up quickly, but they do rise; they prefer Slow Growth to a meteoric rise, arriving unobtrusively at the site of power. They can sometimes be of Low Intellect, knowing only how to make gains; they may be exceedingly Narrow-Minded or only able to do things by the book. They Look Ahead and Consolidate Their Gains as they move forward, as they are very Cautious. They have Little Initiative and prefer to take the tried-and-true path to gain as opposed to taking risks. However, if the risk is not too extreme and promises great gains, they are often willing to take that chance, for no man who earned his own fortune got there without taking any risks; it’s a matter of taking carefully calculated risks. The Rider-Waite art shows a man sitting on a throne surrounded by impenetrable stone and lots of green plant life, his robe colored with images of green leaves. He has gotten to where he is through slow growth, like the mighty tree, saving up a little every day. He owns a large castle seen in the background, and is calm and secure in himself and his future. He is the younger version of the man we saw in the Ten of Disks: Wealth. The Thoth art shows a man on a still horse, looking off ahead into the distance, pausing to rest and plan his path carefully. While he looks one way, his horse looks the other way, keeping them both safe, emphasizing caution. His weapon is a club; he uses brute force to get his way, as opposed to trickery or more subtle plays, like a sword would require. In a reading, this card asks you to examine the roles that people with personality may play in your life. Do you know anyone who works hard, plans out their every move carefully, and only takes carefully-calculated risks? Reversed, this personality is hidden or twisted somehow; maybe a friend’s showy acts of courage are not quite as courageous as they appear, or their gains are not achieved through hard work and industry – or maybe their hard work has not yet been rewarded. The Ten of Disks. Wealth. Material Success. Performance. Establishment. Restlessness. Jealousy. Permanence. Greed. Boredom. Dissatisfcation. Having it All. The Futility of Having it All. The Ten of Disks corresponds to the Sefirot of Malkuth: Reality, the Root, the Sum, and the Origin. The Ten of Disks represents what happens when the energy of practicality and the material world interacts with… reality and the material world. As such, as these two ideas are harmonious with each other, the Ten of Disks is more positive than the other three Tens (Oppression, Satiety, and Ruin). The Ten of Disks represents what happens when someone filled with practical wisdom, prudence, power, and the ability to work with others and to shift and change with the times lives and interacts with reality. This card represents the final culmination of the Suit of Disks when applied to reality, and it results in Wealth for the exemplar of Disks. They have Performed their roles well and been rewarded for it; even if their heart isn’t in their Performance. They have had great Material Success, and have been able to Establish themselves and their descendants as important. In this sense, the idea of Malkuth as being about rebirth becomes apparent as well; passing on one’s wealth to one’s children starts the cycle of material gain again, keeping the energy of Disks alive. This card, then, represents Having it All, but also represents the negative consequences of it as well. You may have everything, but others may be Resentful of it, or Jealous. You may not be able to stop your desire to accumulate things, and may become Greedy or perhaps Restless and Dissatisfied; you have had Material Success, yes, but what about spiritual, emotional, intellectual, and purposeful fulfillment? In this way, this card also represents the Futility of Having it All; this card serves as a reminder that there is more to the world than the material. The Rider-Waite art shows an old man, with two of his descendants before him, hinting at ideas of Permanence and Establishment; his line will live on. He lives in great luxury, wears fancy clothes, and even has two dogs attending to him. He has succeeded in life. Yet at the same time, he isn’t really doing anything – he had it all, so he has nothing left to do. He is Bored. The Thoth art shows ten Disks arranged in the shape of the Tree of Life, representing completion. As the last numbered card of the final Suit, this card has a special meaning with regards to the Sefirot, as finishing the cycle – and starting it again. Behind these ten bright coins/Disks is a pile of other coins, representing having lots of wealth. In a reading, this card asks you to examine the role of Material Gain in your life; have you or anyone near you experienced it? Do you consider yourself wealthy? Do you have everything you wanted (materially), and yet still feel dissatisfied? Do you feel as if you’re performing a role you don’t really feel in order to obtain material wealth? Does your heart lie somewhere else? Reversed, this card’s energies are blocked or twisted somehow; is your wealth inaccessible? In areas you wouldn’t normally look? Are you wealthy and satisfied? The Nine of Disks. Gain. Refinement. Self-reliance. Discipline. Getting Things. Receiving the Fruits of Your Labor. 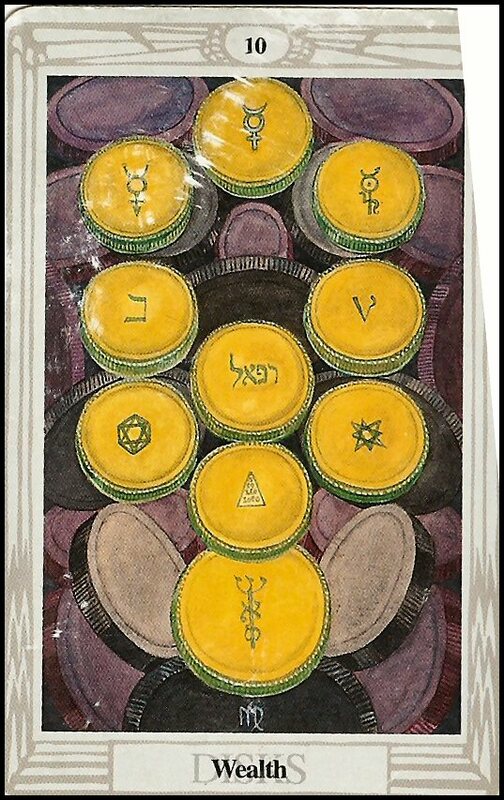 The Nine of Disks corresponds to the Sefirot of Yesod: Crystallization and the Essence of Being. This card’s energy represents the best the Suit of Disks has to offer, and is the resolution of the two weaknesses of the Suit of Disks. 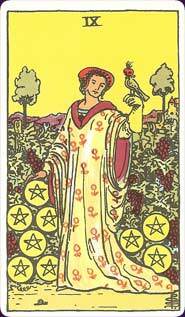 This card represents the recovery from Failure by using the appropriate amount of Prudence (not too much). Once one uses Prudence to make up for their faults as seen in Failure, they will begin to Gain. While Prudence represents the labor that goes into making something happen, Gain represents to the Fruits of That Labor, and the act of enjoying and Receiving them. With regards to the Suit of Disks’ Crystallized Essence of Being, this card represents one’s essence of they adhere to the ideals of the Suit of Disks; they are Disciplined and Self-reliant; they can make their own way in the world. This person is also Refined and civilized, as s/he knows how to succeed in the world and Gain from it. This card represents the energies associated with succeeding in the world, and the good things that come from it; this card is the sum total of the Suit of Disks, and represents the best the suit has to offer.